This iaito review by esteemed SBG Forum member, author of our exclusive free ebook 'Japanese sword arts 101' and fellow Australian Sword enthusiast Darren McNamara (aka chopchop) first appeared on the SBG forum as a progressive review (after all, Japanese training swords have to last the distance!) but is now immortalized here on the main site proper. In it, we take a look at what are arguably the best value for money, yet high quality non sharpened Japanese training swords on the market today: the Delux Non-sharpened iaito by Cheness Cutlery - a real carbon steel (as opposed to the standard zinc aluminum) blunt. 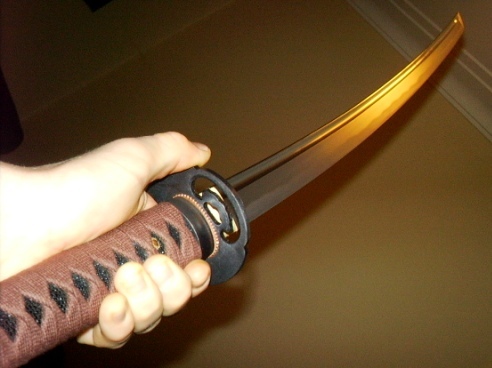 My last Iaito was a Japanese one with a zinc-alloy blade. It did me a good 6 years of trusty service and a friend owned it before me so it was a pass-on but still in good condition when I received it. However, due to my current art and my want to implement realistic training methods I systematically buggered up the blade doing jitte-jutsu with it. Handy hint  Zinc-alloy blades and steel jitte dont mix! So I decided to retire it and another mate asked if he could have it for the Koshirae (fittings), so it was passed on again. This left me with a little hole in my training regime, and slowly but surely the hole got bigger until the only man who could help me was Paul from SBG and his Cheness STEEL Iaito. I was given an arm twisting offer by him on the type 8 steel model but went with the 29 delux model instead. Mostly because I am a bit of a sucker for brown ito/ black same which this model incorporates. First picture was just out of the box ( and NO, I didnt cut up the box with the sword!). 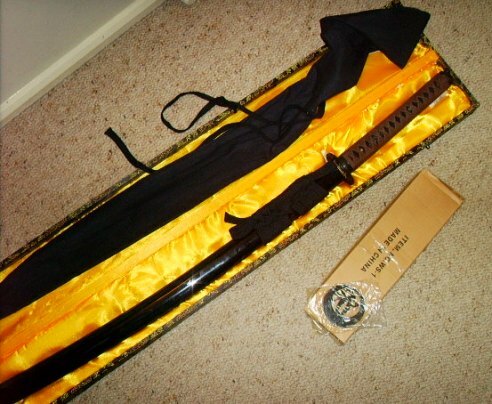 The obligatory Chinese-style inner sword box with Iaito; the small box is the sword stand, and on top of it is the flying cranes tsuba I ordered to replace the Shura Tsuba it comes with. The Ito is quite tightly wrapped and all aspects of this Iaito seem very secure. The saya is a bit tight on the habaki (blade collar) but most are when you receive them new but will always loosen over time and excessive drawing. 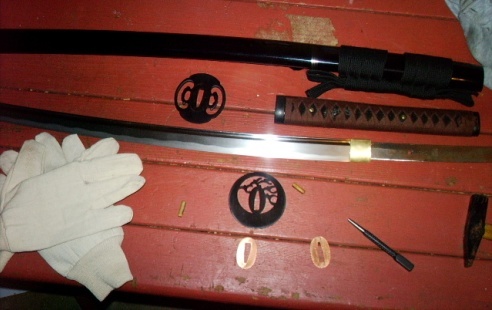 The next photo shows the Iaito as it came with the Shura tsuba on it. 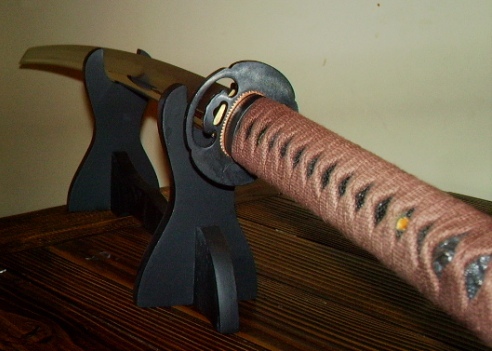 The blade is a 1045 steel unsharpened one and has an etched hamon for aesthetics only. It came with all that packing grease on it but was easily removed with a bit of a wipe and then oiled up as all carbon steel blades(sharpened or unsharpened) need to be. 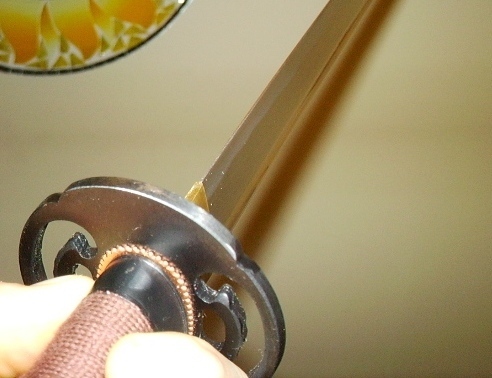 The point of an Iaito is only to be used as a training weapon, to improve your techniques without the danger of having to use a sharpened shinken (live sharpened blade). An Iaito is never a sword but must always be treated as if it were one. If you pursue a JSA, Iaito are like a stepping stone to a complete proficiency with shinken. Before Iaito there is bokken(wooden sword). Even though I have pursued kenjutsu/Iaido for many years, I still use bokken/Iaito for a high percentage of my training needs every week. In laymans terms, we teach beginners with a blunted blade to remove incident or worrying concern that the practitioner or a fellow student may accidentally harm themselves or another with a sharpened blade. Besides this fact, there is no insurance company that I know of that would cover us to use live blades with beginners when we all have to learn from scratch anyway. I suppose it can fall under the joke, when is a sword not a sword? When it is an Iaito! As my current JSA teaches jitte jutsu, the steel blade should endure a harder regime of contact. The last photo for now I have tried to capture the blunted edge. It is the white line running up the edge of the blade. My last Iaito and most of the shinken I use are usually 28 but as I am 6 3 I can use a longer blade if I like. This inspired me to get the 29 model which I do notice the difference on when re-sheathing and the moved centre of balance when swinging. However, you have to love the bo-hi (groove down the blade) when it sings as I swing it (tachi-kaze). This is also a good indication that you are swinging it correctly as if you do it incorrectly there is either no noise or a whirring sound to let you know. EDITORS NOTE: At this point in the review, Darren went through the procedure of disassembling the sword to put on the new Tsuba. I think I am going to have to give this Iaito a 4/5 for presentation simply because I have taken it apart and found no discord with the blade quality or any of its fittings (except the shura tsuba which is why I gave it a 4 and not a 5). The menuki is a coiled dragon in a bronze tone that matches the ito and same very nicely. The Ito seems to be wearing nicely and is quite tight with even diamonds, there is a little movement but nothing to disappoint. I do like the sori (curvature) on this blade as well. It is a bit more so than my PPK, gives it a rather prominent feel like you want to hold it blade out for some reason. I think it is just the shift in p.o.b that I am still finding new. Well I am totally happy with the way it has turned out, I know it was a small alteration but it also gives me a chance to undress the blade and see what lies under the surface. I can foresee many happy days of training with this Iaito. While I do not do tameshigiri everyday, I try to do Iai kata or jittejutsu at least once in every day so in theory I will get my money's worth more in terms of using it for what it is meant for i.e. training sword. For this I am going to give it 5/5 for Value for money. You would be very hard up to find another carbon-steel Iaito with this quality at this price. Every Cheness blade I get never lets me down. Durable, functional, and the price is just right for my needs. Not accepted at all dojos (especially those who only allow the use of super light weight aluminum alloy iaito) When in doubt, ask your sensei!